Such scapegoating only serves to obscure the real causes of the disastrous “accident”. A combination of lax environmental, labour and maritime regulation combined to produce the perfect conditions for the grounding. In accordance with New Zealand maritime law, the crew of the Lybian-flagged Rena were not allocated the same rights as other workers in Aotearoa. They worked long periods at sea for little pay. In court, the Rena’s captain was described as being “obsessed with reaching port by 3 am”, leading him to take unnecessary risk. But that’s little wonder he was due for a period of shore leave and hadn’t been home to see his family in one and a half years. Meanwhile, the company responsible for the Rena is under no obligation to pay for the clean-up. Under New Zealand’s flagship environmental law the Resource Management Act, liability is limited to only $600,000. 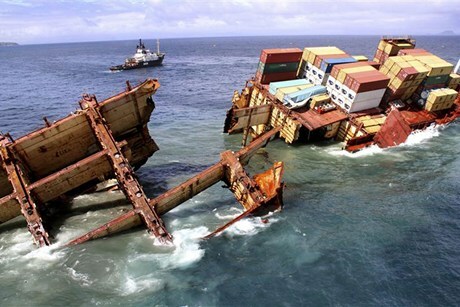 Maritime laws also put limits on the ship owners’ liability. Meanwhile the estimated cost of the disaster is as much as $47 million. Without adequate regulation and penalties that amount to a mere slap on the wrist, an environment was created where corporations run rampant with little regard for the consequences of their actions. In spite of having to foot for as much as a $20 million shortfall in funds for the clean-up, the National government has no plans to do anything about the situation. For National, the interests of business trump the interests of the environment. “As a country that significantly requires shipping into our ports, for our economy to survive, we just have to wear this one” Transport Minister Gerry Brownlee told the media on Tuesday the 2nd of October. In other words, penalties that could hit importers in the pocket are out of the question. Furthermore, even the limited provisions of the RMA are under attack as the government seeks exemptions for industrial projects of “local significance” in addition to the many exemptions already in place. But they haven’t got everything their own way. The tactics of protest and direct action that made New Zealand nuclear free in the 1980s are being resurrected. Protests by Te-Whanau-a-Apanui in the Rakamura Basin succeeded in forcing out oil prospectors. They’ve shown what can be achieved. We must organise to defend the environment. « The Fire Last Time: The Rise of Class Struggle and Progressive Social Movements in Aotearoa, 1968-1977.